Enter the Kellogg’s MLS Soccer Sweepstakes by uploading a selfie with participating Kellogg’s products at kelloggmlssweeps.com and you could win a trip to any MLS game or one of 1,000 other prizes. Ends: 11:59:59 AM (ET) on 7/31/18. Prize: A trip for winner and up to three (3) guest to attend one 2018 or 2019 Major League Soccer regular season game of the winner’s choice in the United States or Canada. 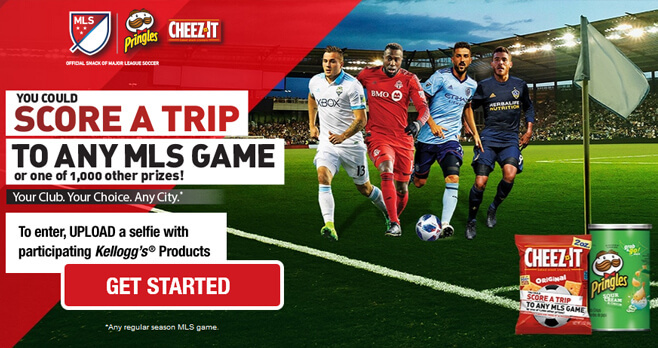 Eligibility: Kellogg’s MLS Soccer Sweepstakes is open to legal residents of the 50 United States and District of Columbia who are 18 years of age or older at the time of entry.